In May 2003, Chris Hedges gave a controversial commencement speech at Rockford College (Rockford University since 2013) in Illinois. Back then, Hedges was an award-winning reporter for the New York Times who had recently completed a book, War Is A Force that Gives Us Meaning (2002), which I highly recommend. Earlier that month, President George W. Bush had given his “Mission Accomplished” speech about the Iraq war, and patriotic pride was riding high. Hedges had the foresight to recognize the mission had not been accomplished, and that the cost of war (all wars) would be high to the United States as well as to the countries purportedly liberated. Booed and interrupted on several occasions during his speech, Hedges persevered. His words from 2003 are well worth reading again, especially as President-elect Trump assembles a team of former generals and hardline rightists with the promise of obliterating ISIS and of “winning” conflicts around the world. Killing, or at least the worst of it, is over in Iraq. Although blood will continue to spill — theirs and ours — be prepared for this. For we are embarking on an occupation that, if history is any guide, will be as damaging to our souls as it will be to our prestige, power, and security. But this will come later as our empire expands and in all this we become pariahs, tyrants to others weaker than ourselves. Isolation always impairs judgment and we are very isolated now. We have forfeited the good will, the empathy the world felt for us after 9-11. We have folded in on ourselves, we have severely weakened the delicate international coalitions and alliances that are vital in maintaining and promoting peace and we are part now of a dubious troika in the war against terror with Vladimir Putin and Ariel Sharon, two leaders who do not shrink in Palestine or Chechnya from carrying out acts of gratuitous and senseless acts of violence. We have become the company we keep. The censure and perhaps the rage of much of the world, certainly one-fifth of the world’s population which is Muslim, most of whom I’ll remind you are not Arab, is upon us. Look today at the 14 people killed last night in several explosions in Casablanca. And this rage in a world where almost 50 percent of the planet struggles on less than two dollars a day will see us targeted. Terrorism will become a way of life, and when we are attacked we will, like our allies Putin and Sharon, lash out with greater fury. The circle of violence is a death spiral; no one escapes. We are spinning at a speed that we may not be able to hold. As we revel in our military prowess — the sophistication of our military hardware and technology, for this is what most of the press coverage consisted of in Iraq — we lose sight of the fact that just because we have the capacity to wage war it does not give us the right to wage war. This capacity has doomed empires in the past. The real injustices, the Israeli occupation of Palestinian land, the brutal and corrupt dictatorships we fund in the Middle East, will mean that we will not rid the extremists who hate us with bombs. Indeed we will swell their ranks. Once you master people by force you depend on force for control. In your isolation you begin to make mistakes. Fear engenders cruelty; cruelty, fear, insanity, and then paralysis. In the center of Dante’s circle the damned remained motionless. We have blundered into a nation we know little about and are caught between bitter rivalries and competing ethnic groups and leaders we do not understand. We are trying to transplant a modern system of politics invented in Europe characterized, among other things, by the division of earth into independent secular states based on national citizenship in a land where the belief in a secular civil government is an alien creed. Iraq was a cesspool for the British when they occupied it in 1917; it will be a cesspool for us as well. The curfews, the armed clashes with angry crowds that leave scores of Iraqi dead, the military governor, the Christian Evangelical groups who are being allowed to follow on the heels of our occupying troops to try and teach Muslims about Jesus. The occupation of the oil fields, the notion of the Kurds and the Shiites will listen to the demands of a centralized government in Baghdad, the same Kurds and Shiites who died by the tens of thousands in defiance of Saddam Hussein, a man who happily butchered all of those who challenged him, and this ethnic rivalry has not gone away. The looting of Baghdad, or let me say the looting of Baghdad with the exception of the oil ministry and the interior ministry — the only two ministries we bothered protecting — is self immolation. As someone who knows Iraq, speaks Arabic, and spent seven years in the Middle East, if the Iraqis believe rightly or wrongly that we come only for oil and occupation, that will begin a long bloody war of attrition; it is how they drove the British out and remember that, when the Israelis invaded southern Lebanon in 1982, they were greeted by the dispossessed Shiites as liberators. But within a few months, when the Shiites saw that the Israelis had come not as liberators but occupiers, they began to kill them. It was Israel who created Hezbollah and was Hezbollah that pushed Israel out of Southern Lebanon. This is a war of liberation in Iraq, but it is a war now of liberation by Iraqis from American occupation. And if you watch closely what is happening in Iraq, if you can see it through the abysmal coverage, you can see it in the lashing out of the terrorist death squads, the murder of Shiite leaders in mosques, and the assassination of our young soldiers in the streets. It is one that will soon be joined by Islamic radicals and we are far less secure today than we were before we bumbled into Iraq. We will pay for this, but what saddens me most is that those who will by and large pay the highest price are poor kids from Mississippi or Alabama or Texas who could not get a decent job or health insurance and joined the army because it was all we offered them. For war in the end is always about betrayal, betrayal of the young by the old, of soldiers by politicians, and of idealists by cynics. Read Antigone, when the king imposes his will without listening to those he rules or Thucydides’ history. Read how Athens’ expanding empire saw it become a tyrant abroad and then a tyrant at home. How the tyranny the Athenian leadership imposed on others it finally imposed on itself. This, Thucydides wrote, is what doomed Athenian democracy; Athens destroyed itself. For the instrument of empire is war and war is a poison, a poison which at times we must ingest just as a cancer patient must ingest a poison to survive. But if we do not understand the poison of war — if we do not understand how deadly that poison is — it can kill us just as surely as the disease. We were forced to see ourselves as others saw us and the sight was not always a pretty one. We were forced to confront our own capacity for atrocity — for evil — and in this we understood not only war but more about ourselves. But that humility is gone. War, we have come to believe, is a spectator sport. The military and the press — remember in wartime the press is always part of the problem — have turned war into a vast video arcade came. Its very essence — death — is hidden from public view. The seduction of war is insidious because so much of what we are told about it is true — it does create a feeling of comradeship which obliterates our alienation and makes us, for perhaps the only time of our life, feel we belong. Once in war, the conflict obliterates the past and the future all is one heady intoxicating present. You feel every heartbeat in war, colors are brighter, your mind races ahead of itself. We feel in wartime comradeship. We confuse this with friendship, with love. There are those who will insist that the comradeship of war is love — the exotic glow that makes us in war feel as one people, one entity, is real, but this is part of war’s intoxication. Think back on the days after the attacks on 9-11. Suddenly we no longer felt alone; we connected with strangers, even with people we did not like. We felt we belonged, that we were somehow wrapped in the embrace of the nation, the community; in short, we no longer felt alienated. As this feeling dissipated in the weeks after the attack, there was a kind of nostalgia for its warm glow and wartime always brings with it this comradeship, which is the opposite of friendship. Friends are predetermined; friendship takes place between men and women who possess an intellectual and emotional affinity for each other. But comradeship — that ecstatic bliss that comes with belonging to the crowd in wartime — is within our reach. We can all have comrades. In friendship there is a deepening of our sense of self. We become, through the friend, more aware of who we are and what we are about; we find ourselves in the eyes of the friend. Friends probe and question and challenge each other to make each of us more complete; with comradeship, the kind that comes to us in patriotic fervor, there is a suppression of self-awareness, self-knowledge, and self-possession. Comrades lose their identities in wartime for the collective rush of a common cause — a common purpose. In comradeship there are no demands on the self. This is part of its appeal and one of the reasons we miss it and seek to recreate it. Comradeship allows us to escape the demands on the self that is part of friendship. In wartime when we feel threatened, we no longer face death alone but as a group, and this makes death easier to bear. We ennoble self-sacrifice for the other, for the comrade; in short we begin to worship death. And this is what the god of war demands of us. Think finally of what it means to die for a friend. It is deliberate and painful; there is no ecstasy. For friends, dying is hard and bitter. The dialogue they have and cherish will perhaps never be recreated. Friends do not, the way comrades do, love death and sacrifice. To friends, the prospect of death is frightening. And this is why friendship or, let me say love, is the most potent enemy of war. Thank you. Posted on November 30, 2016 by wjastorePosted in Higher Education, US Military, warTagged Athens, Chris Hedges, comradeship, Iraq War, nature of war, patriotism, terrorism, Thucydides. What drives America today is, in fact, business — just as was true in the days of Calvin Coolidge. But it’s not the fair-minded “free enterprise” system touted in those freshly revised Texas guidelines for American history textbooks; rather, it’s a rigged system of crony capitalism that increasingly ends in what, if we were looking at some other country, we would recognize as an unabashed kleptocracy. That’s what we’re witnessing right now with Trump and his family: crony capitalism. Unabashed kleptocracy. It’s nothing new, except now it’s being done openly and unapologetically by the president-elect, who claims the law of the land says he can’t have conflicts of interest, because as president he’s exempted from those laws. Recall the saying that history repeats itself, first as tragedy and then as farce. Trump is both tragedy and farce, but more than anything, he’s a tragedy for our democracy. An old Roman maxim enjoins us to “let justice be done, though the heavens fall.” Within our kleptocracy, the prevailing attitude is an insouciant “We’ll get ours, though the heavens fall.” This mindset marks the decline of our polity. A spirit of shared sacrifice, dismissed as hopelessly naïve, has been replaced by a form of tribalized privatization in which insiders find ways to profit no matter what. Trump is a family man in every sense of the word. His business is a family business. No matter what anyone tells you, there’s no more way to separate him from his brand, with his kids running it, than there is to separate a shark from the ocean or Ivanka from her line of jewelry. There’s no way this administration can be anything but a walking, talking conflict of interest of a kind never before seen or even imagined in this country. It’s easy, in fact, to guarantee one thing: that foreign business and political interests will have a field day when it comes to applying pressure to the new American president. Truer words were never written. Imagine placing Gordon “Greed is Good” Gekko (he of cinematic “Wall Street” infamy) in charge of America, and that’s Trump, except Trump seems to have even fewer scruples. Descending the switchback escalators [in the Trump Tower], I found myself gazing at the lobby where a scrum of reporters stood waiting for golden elevator doors to open, potentially disgorging a Trump family member or some other person hoping to serve at the pleasure of the next president. Behind me water cascaded several stories down a pink marble wall, an overblown monument to a bygone age of excess. Ahead of me, glass cases filled with Trump/Pence 2016 T-shirts, colognes with the monikers “Empire” and “Success,” the iconic red “Make America Great Again” one-size-fits-all baseball cap, stuffed animals, and other tchotchkes stood next to an overflowing gilded garbage can. Heading for the door, I thought about all of this and Joe [a secret service agent] and his commando-chic colleague and Trump’s deserted private-public park, and the army of cops, the metal barricades, and the circus that awaited me on the street. I felt I’d truly been given some hint of the future, a whisper of what awaits. I also felt certain I’d be returning to Trump Tower — and soon. Circus, indeed. Trump has mastered that, but will he provide the bread as well to complete the bread and circuses pairing? And will the people be satisfied with empty spectacle and a few crumbs of bread as Trump takes America for a kleptocratic ride? It was said about the Emperor Nero that he fiddled while Rome burned. Instead of fiddling, Trump, one assumes, will make deals and sell trinkets, all for his personal profit, even as American democracy burns. Welcome to kleptocracy in the open, America. As the inferno rages, remember this happy fact: For only $10,000 you too can wear Ivanka’s bracelet! One bracelet to bring them all and in the darkness bind them. Big Blue Books: Bring Them Back! Sold for as little as a nickel or a dime the Little Blue Books and the larger-format Big Blue Books were published and republished by the Haldeman-Julius publishing house located in Girard, Kansas to foster the ideals of American socialism and to provide a basic education for the working man. Titles began appearing as early as 1919, but the Little Blue Books series was not christened until 1923. I think my copy dates from the late 1920s or early 1930s, since it features a catalog at the back that says 1500 “Little Blue Books” are available, all for a nickel each. You could order all of them — all 1500 books — for $45.00, “packing and carriage charges” included. The “little” books were about 3.5″ x 5,” or the size of a small index card, a handy size for shirt pockets; my “big” book is roughly 5.5″ x 8.5″. Amusingly, the advert used these words to sell them: “There is not a trashy, cheap book in the lot.” The “blue” came from the color of the cover (mine is faded), not from any “blue” or lurid contents. Perhaps my favorite title is the “Tyranny of Bunk.” We could use a book like that for these times. Titles featuring Voltaire, agnosticism, Clarence Darrow (of the famous Scopes Trial, in which he defended the teaching of evolution), and the debunking of religious miracles point to the free-thinking nature of these books. Here the “working man” is not being talked down to; rather, he’s being given the intellectual tools with which he can lift himself up. Workers of America, read Blue Books and become educated: that was the message of these books. Workers of those days had fewer distractions than the workers of today. No vapid television, no video games, no materialistic orgies on Black Friday and Cyber Monday: one can imagine more than a few workers picking up a Blue Book for a nickel and enjoying it. How much was a nickel back then? My dad was a teenager in the early 1930s. He told me you could go to the cinema for a nickel. In other words, a nickel was real money, but it was also a manageable sum. Nowadays, I suppose, anyone with a computer and an Internet connection has access to libraries of knowledge that far surpass 1500 “Little Blue Books” and their “Big Blue” cousins. Yet I can’t quite shake the feeling that something is lost in today’s cyberworld. Under socialism and other free-thinking systems of the Roaring Twenties and Depressed Thirties, there was faith in workers, specifically in educated workers, as representing the future of a better, a more just, a fairer America. Do we still have that same faith, that same optimism, in the common man (and woman)? It doesn’t seem that way. We are simply not trying to educate everyone roughly equally, irrespective of social class and status and so on. Assuming literacy, back then it seemed that all that was needed was to place the right books in the hands of workers thirsty for knowledge. Maybe that was a simple vision, but I admire its idealism. Can we “make America great again” by getting Americans to read again? To read real books that address serious subjects in a mature way? Why not start with some new, inexpensive, little and big blue books? No lithium batteries or internet required. Not a bad step, I think, as we fight to restore Democracy and against idiocracy. In two recent speeches, President Obama has repeated the conceit that the United States is “the indispensable nation.” Apparently, that means the U.S. must lead “the free world,” with a none-too-subtle corollary that other “free” nations must follow. Yet the conceit of indispensability gets the U.S. into serious trouble. It facilitates interventionism and meddling, and when the U.S. intervenes and meddles, it’s almost always in military ways, often disastrously (Afghanistan, Iraq, Libya are just three recent examples). It [the notion of total safety] must be a post-1941 thing [after the shocking sneak attack on Pearl Harbor]. I think in both cases (1917 [U.S. entry into World War I] and 1941 and maybe 2001) the question Americans have asked is how to keep an evil “over there” somehow from affecting us. In all three cases, I think the answer was neutrality until neutrality no longer seemed to offer safety. My guess is that the idea that total safety required global involvement comes from c.1948, fears of the USSR’s globalism, atomic paranoia, and the desire to protect and preserve the new American affluence. Thus NSC-68 gets passed with nary a whisper of opposition. According to the [National Security Council’s] report, the United States should vigorously pursue a policy of “containing” Soviet expansion. NSC-68 recommended that the United States embark on rapid military expansion of conventional forces and the nuclear arsenal, including the development of the new hydrogen bomb. In addition, massive increases in military aid to U.S. allies were necessary as well as more effective use of “covert” means to achieve U.S. goals. The price of these measures was estimated to be about $50 billion; at the time the report was issued, America was spending just $13 billion on defense. Under President Trump, we’re likely to see a new version of NSC-68, another expansion of the U.S. military (and U.S. militarism), along with covert action by a newly empowered CIA, this time in the name of containing and defeating radical Islam rather than godless communism. A window into Trump’s thinking [on defense] can be found in a speech he gave in Philadelphia in early September. Drawing heavily on a military spending blueprint created by Washington’s right-wing Heritage Foundation, Trump called for tens of thousands of additional troops, a Navy of 350 ships (the current goal is 308), a significantly larger Air Force, an anti-missile, space-based Star Wars-style program of Reaganesque proportions, and an acceleration of the Pentagon’s $1 trillion “modernization” program for the nuclear arsenal (now considered a three-decade-long project). Todd Harrison of the Center for Strategic and International Studies estimates that, if Trump faithfully follows the Heritage Foundation’s proposal, he could add more than $900 billion to the Pentagon’s budget over the next decade. In other words, Obama’s America, the “indispensable nation,” is likely under Trump to channel enormous resources into more weapons even as Trump’s military advisers, men like retired general Mike Flynn, posture for a no-holds-barred crusade against “the cancer” of radical Islam around the globe. Here’s a harsh truth: America has allowed its arsenal of democracy of World War II fame to become simply an arsenal. A nation that fought in the name of democracy in two world wars has become one that wages endless wars driven by a crusader’s righteousness. Remind me: What is so “indispensable” about that? Posted on November 22, 2016 by wjastorePosted in US Military, US Politics, warTagged arsenal of democracy, Cold War, Donald Trump, indispensable, Mike Flynn, NSC-68, Obama Administration, Pentagon, radical Islam, Trump. George Will has an article here https://www.washingtonpost.com/opinions/higher-education-is-awash-with-hysteria-that-might-have-helped-elect-trump/2016/11/18/a589b14e-ace6-11e6-977a-1030f822fc35_story.html in which he caricatures higher education as coddling students, as sheltering them in “safe spaces” from “micro-aggressions” while providing “trigger warnings” of ideas and events that might upset them. In short, it’s hysterical liberals who are responsible for electing Trump, according to Will. This is pure nonsense. Higher education is not too liberal: it’s too beholden to corporate and financial interests and the military-industrial complex, as I explained in this article. Nowadays, higher ed is just another business, with students treated as customers and faculty as providers. And if we’re going to run higher ed as a business, why not the country? If college presidents are hired because they are great at fund raising and have close ties to high finance and big government, why not elect a president whose main claim to fame is making (and losing) money? George Will gets it exactly wrong: higher ed is not too liberal or too radical, it’s far too obedient and compromised. 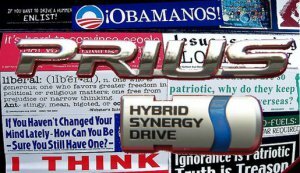 Prius Politics — Seen at a campus near you! I have conservative friends (Yes, I do!) who express disfavor with higher education. They see higher ed as being in lockstep with liberal/leftist agendas. Things like gay marriage, aggressive feminism, multiculturalism, and diversity that focuses not on wide-ranging political views but on the politics of gender and race. They further see higher ed as being unfriendly to conservatives, hostile to organized religion (especially Christianity), and intolerant of alternative views that challenge leftist shibboleths. There’s truth to this critique. I’ve been around enough liberal faculty members to recognize a certain collectivism, often manifested by smug superiority, in their treatment of anyone who challenges their views. So-called Birkenstock Bolsheviks are hardly immune to prejudice, including the refusal of job interviews or the denial of tenure to conservatives. Such prejudice is especially galling among faculties that pride themselves on tolerance. What Will “Freedom” Mean in a Trump Administration? Remember the 1st and 4th Amendments? What will freedom mean in a Trump administration? During his campaign, why did Trump harp on the Second Amendment but none of the others? How did our country come to define freedom as buying lots of guns and ammo without restrictions, or flying objectionable symbols such as Confederate battle flags? What kind of “freedom” is the freedom to spend lots of money on guns? What kind of “speech” is flying a symbol that is highly offensive and hateful to many Americans? The “freedom” to fly a flag associated with slavery, rebellion, oppression, and racism doesn’t seem to me to be much of a “freedom.” The same is true of the “freedom” to spend lots of money on guns and ammo. What is so “free” about that? The “freedom” of the average Joe has come to be defined as the right to carry guns or the right to fly racist flags. But what about the right to a living wage, the right to privacy, the right to good health care, the right to a decent education, the right to clean water and fresh air, the right to have a real say in the political process? These rights are being increasingly abridged, yet so many Americans see no infringement to their “freedom” here. Surely one of the great triumphs of the power elite has been the redefinition of “freedom” such that the freedoms that are allowed, like buying lots of guns, make no impact on the elite’s ability to rule and to exploit. A couple of sobering facts. During his campaign, Trump railed against the press, suggesting that he’d work to change libel laws so that he could sue and punish the press for writing critical stories about him. Also, Trump has suggested some kind of national registry for Muslims, and members of his staff have suggested internment camps for unreliable elements, citing the internment of Japanese-Americans during World War II as a laudable precedent. As the Trump administration takes shape, apparently with men like Jeff Sessions as Attorney General and retired General Michael Flynn as National Security Advisor, Americans would do well to read and re-read the Bill of Rights, all of them, not just rights like the Second Amendment. For what good is it to be able to buy lots of guns if you need to worry about your religion, your right to privacy, your ability to organize and protest, and your right to a press that is untrammeled by the government? Earlier this year, Flynn Tweeted that “fear of Muslims is RATIONAL,” and just last month offered his support for a prominent Alt-Right writer and activist. In his book Field of Fight released earlier this year, Flynn wrote, “I’m totally convinced that, without a proper sense of urgency, we will be eventually defeated, dominated, and very likely destroyed” by Islamic militants, FP’s Paul McLeary and Dan De Luce noted in a story about the book. Sitting in your walled bunker, surrounded by guns as well as the stars and bars and “Don’t Tread on Me” flags, is not much of a “freedom” if the government is illegally watching you, or getting ready to intern you in a camp because you worship God in the name of Allah instead of Yahweh or Jehovah, or getting ready to deport you because not all of your papers are perfectly in order. First they came for undocumented immigrants, and I did not speak out, for I was not undocumented. Then they came for the Muslims, and I did not speak out, for I was not Muslim. Then they came for the protesters, and I did not speak out, for I was not a protester. Then they came for me–and there was no one left to speak for me.